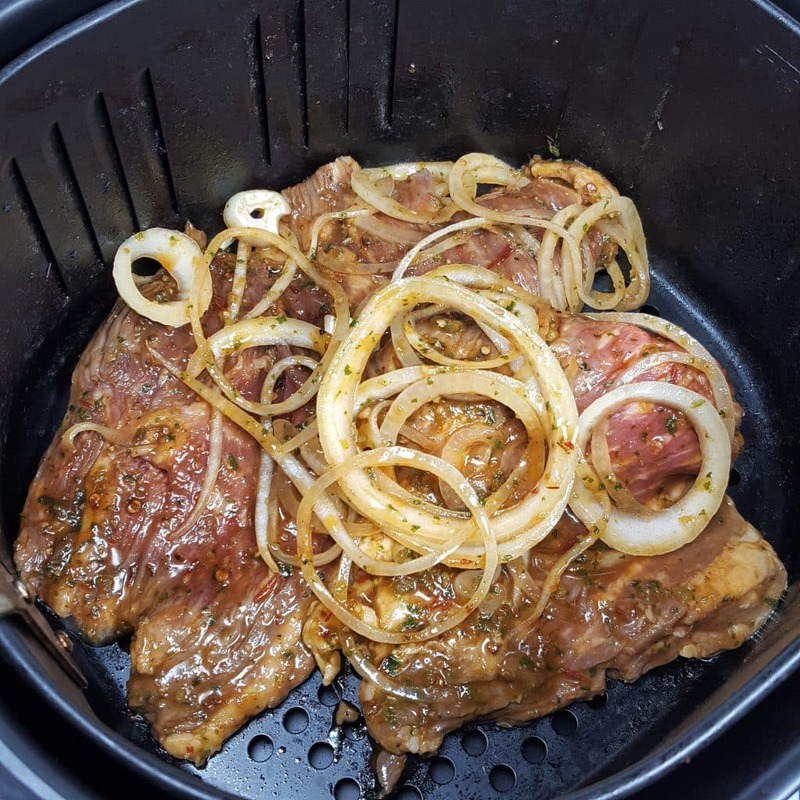 Using your Air Fryer to cook Air Fryer Carne Asada is quick and easy. It is often called “roasted beef” when referred to in English. The skirt steak is marinated overnight in citrus and peppers, which helps to tenderize the meat. The meat is seared on a very high flame, leaving the center of the meat, rare and the outside of the meat is nicely charred. The meat is then cut very thin and used on nachos, tacos and burritos. There are so many different versions of Carne Asada. 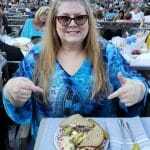 Ed and I have been enjoying Steak Nachos at one of our favorite waterfront dining places in Downtown, Long Beach. We’ve been to the restaurant several times and the Steak Nachos always call our name. The strips of marinated rare Skirt Steak, a top a mountain of tortilla chips, beans, cheese, cilantro, tomatoes, sour cream and guacamole. That appetizer, which is enough for both of us as a main course, is phenomenal. 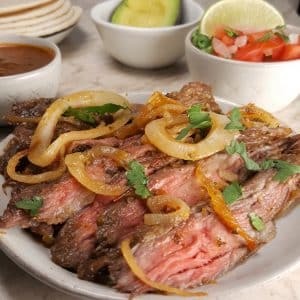 What ingredients are in Air Fryer Carne Asada? As I said, everyone makes their Carne Asada differently and some only use minimal ingredients, like salt and beer. Seville Oranges work really well in this recipe, as they are quite sour. Because they are not always easy to find, I’ve included some sour citrus. My Pressure Cooker Lechon Asado (Cuban Pork) recipe also calls for Seville Oranges, but I gave directions for using regular oranges and lemons. Roasting Peppers is super easy and adds depth of flavor to the Pepper. 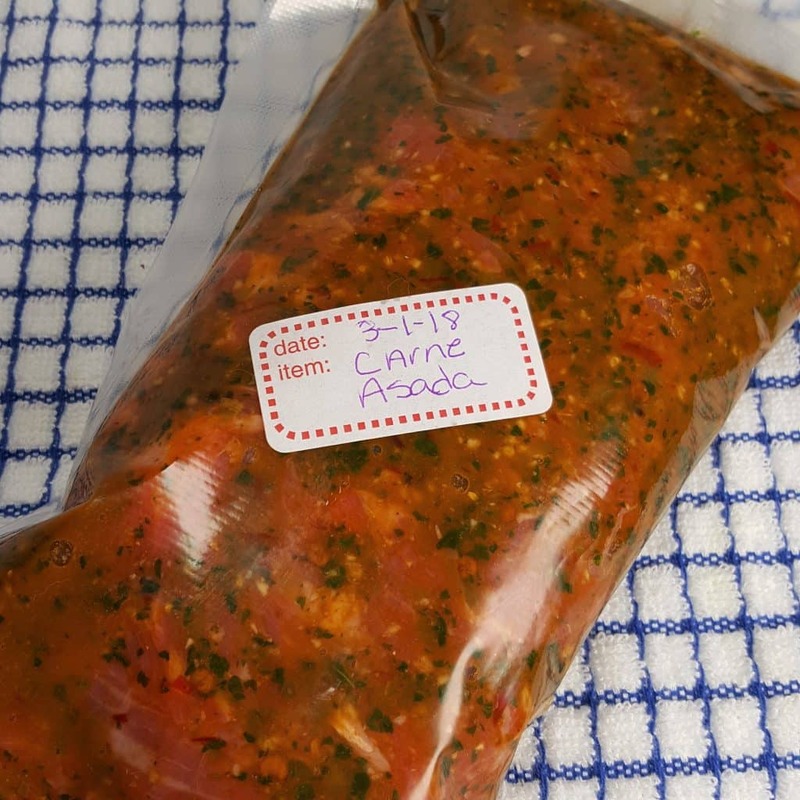 I’ve written a How to Roast Peppers guide, so that you can quickly and easily roast your own Pasilla Peppers. If you cannot find Pasilla Peppers, try using Poblano or Jalapeńo Peppers. The ingredients might look like a long list, but really, there is not much chopping. 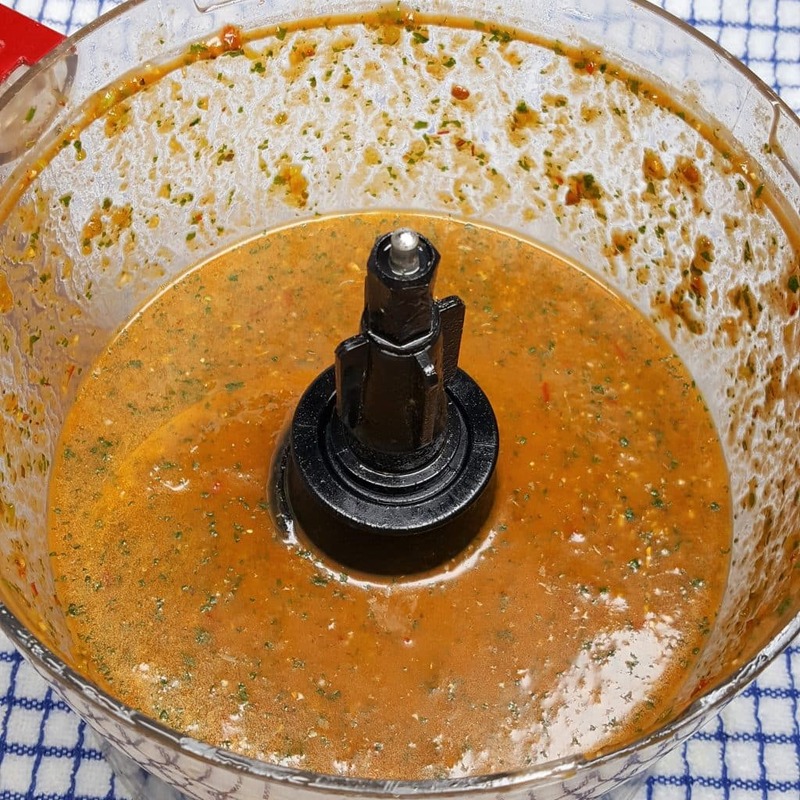 My 11 cup Food Processor does all the heavy work for me. Fresh, in my opinion is almost always better, but if citrus is not readily available in your area, there is nothing wrong in using frozen or refrigerated Lime Juice, Orange Juice or Lemon Juice. True Lime, True Orange, True Lemon is something I always have on hand and can be used in place of fresh citrus as well. I don’t think it is traditional at all to use Lemon Juice in the Marinade. The Citrus Triple blast, really takes this Air Fryer Carne Asada Recipe up another notch. The Marinade will be quite spicy hot at this point. It’s fine and once the Skirt Steak is cooked, it will not be super spicy. Your Marinade should also be a little saltier than you would like. Again, no worries, the end result will not be salty. When I make my Carne Asada recipe on my Charcoal Grill, like to add a little Light Brown Sugar to the Marinade. It will balance the heat from the Peppers. The Air Fryer does not get as hot as the Charcoal Grill, so in order to get some Char on the Skirt Steak, you would have to cook the meat longer. That doesn’t work for me, as I love rare meat, so I have a little trick. 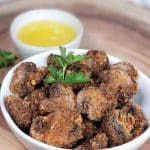 Keep reading…..
*If you are doing Keto, then, obviously, you can totally skip the Brown Sugar, or use a Sugar Substitute, like Swerve or Surkin Gold. 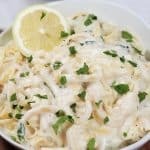 In recipes like my Pressure Cooker Lechón Asado recipe or my Pressure Cooker Moroccan Lemon Chicken with Olives recipe, I suggest that you Marinate overnight. It’s a suggestion, as the meal will taste better. 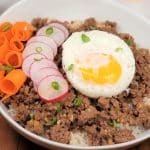 However, in those recipes, a shorter Marination is fine, since the meat is being cooked in an Instant Pot or Pressure Cooker. 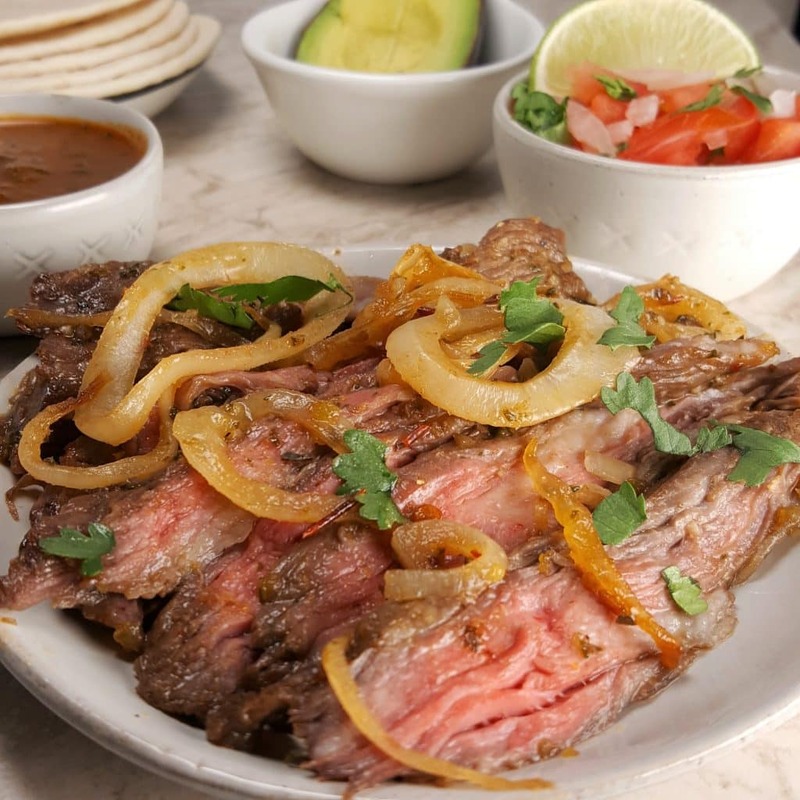 In this Air Fryer Carne Asada Recipe, you definitely need to Marinate the Beef. Skirt Steak is very tough and the cook time is very short. It needs an overnight soak in all that lovely Marinade. The Citrus will help tenderize the meat. 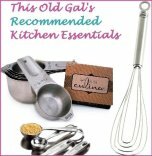 While I enjoy cooking and spending time in the kitchen, there are times when I just want to start cooking right away. This is the reason I purchased my FoodSaver Vacuum Sealing System a couple of years ago. 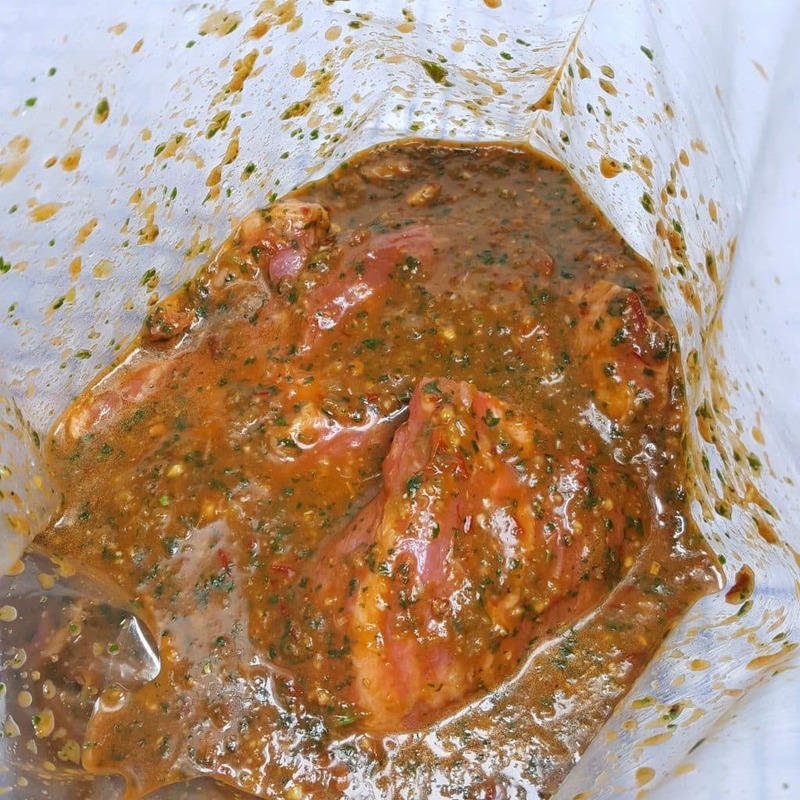 In recipes that call for a Marinade, I almost always will double or triple the recipe and freeze each recipe in a separate Foodsaver “Knock Off” Bag. In this particular case, this recipe is written for two pounds of Skirt Steak. It’s just me and the hubs, so what you see above, is half of the recipe. Here is where my trick comes into play. Instead of adding the Brown Sugar to the Marinade, I sprinkled it on the Steak, so that it would caramelize and Char in the Air Fryer! It’s up to you….add it to the Marinade if you plan on cooking your meat, so that it is not as rare as we like our meat. I am totally loving my new GoWise 5.8 Quart Air Fryer. If you don’t yet have an Air Fryer, it is great time to get one, as the prices are very low. It is always important to give the meat a bit of a rest before slicing. The juices need time to redistribute, which will keep the meat very juicy. If you cut your meat right away, all the juice will run right out. 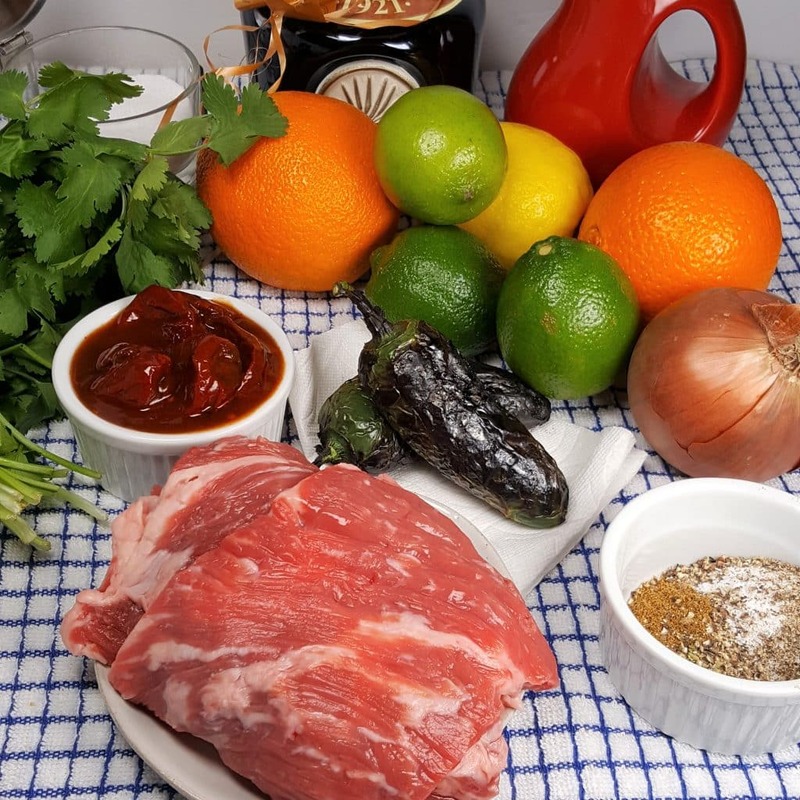 For another delicious Latin recipe, check out my Pressure Cooker Pork Carnitas. Use a very sharp Chef’s Knife and slice the meat very thin and against the grain. Skirt Steak is quite chewy and slicing in this method will make eating the meat more enjoyable. Grab some tortillas and make a taco, or make Steak Nachos, like we get at our favorite waterside cafe. You can ever serve your Air Fryer Carne Asada Recipe as a main course with a vegetable side dish. Try my Pressure Cooker Cuban Style Black Beans and my Pressure Cooker White Rice recipe. Whatever you do, enjoy! 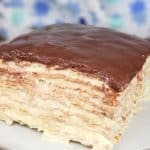 You are going to LOVE this recipe. Seriously! Prepare Pasilla Peppers, following this Charring Method. 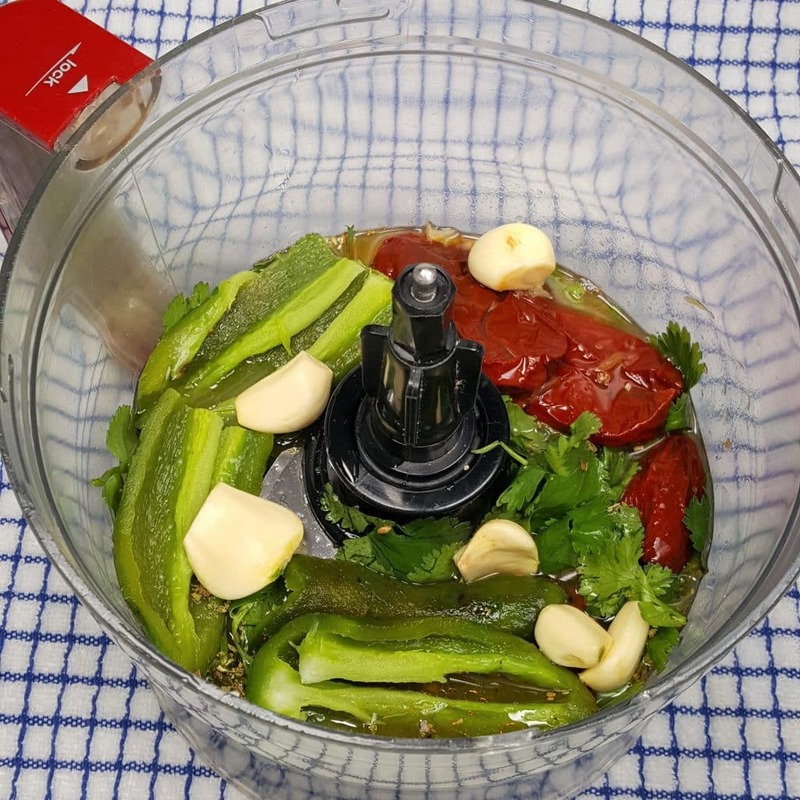 Add Peppers and all Marinade ingredients to food processor. Process until well blended, about 20 seconds. Hold back 1/2 cup of Marinade to use as Salsa. 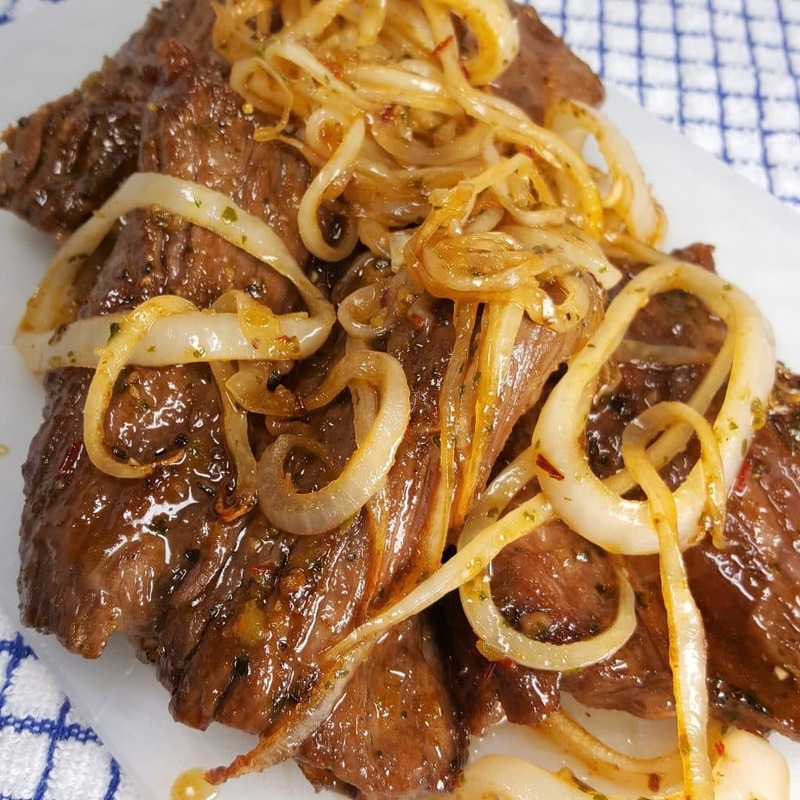 Add Marinade, Steak and Onions to a container or plastic baggie and place into refrigerator for at least three hours or overnight (which is best). When ready to cook, preheat Air Fryer at 400 degrees for 10 minutes. Remove steak from container/baggie and place into preheated Air Fryer. Cook at 400 degrees for 6-8 minutes (for rare), turning over after 4 minutes. Add 1-2 minutes more for medium rare. Remove Steak and Onions from Air Fryer and let rest for 5 minutes. Slice Steak at an angle against the grain and as thin as possible. Serve in Tortillas with Pico de Gallo, Avocado, Shredded Cabbage, Cilantro and Lime Wedges or use for Steak Nachos. Prepare the Sauce (no need to marinate) and add to cooking pot with the Onions. Sauté the onions for 2 minutes in the Sauce, add the meat and cook for 1 minute, with a 5 minute natural pressure release. For rare Skirt Steak, hold back 1 Tablespoons of Brown Sugar and sprinkle it onto the meat, right before cooking. 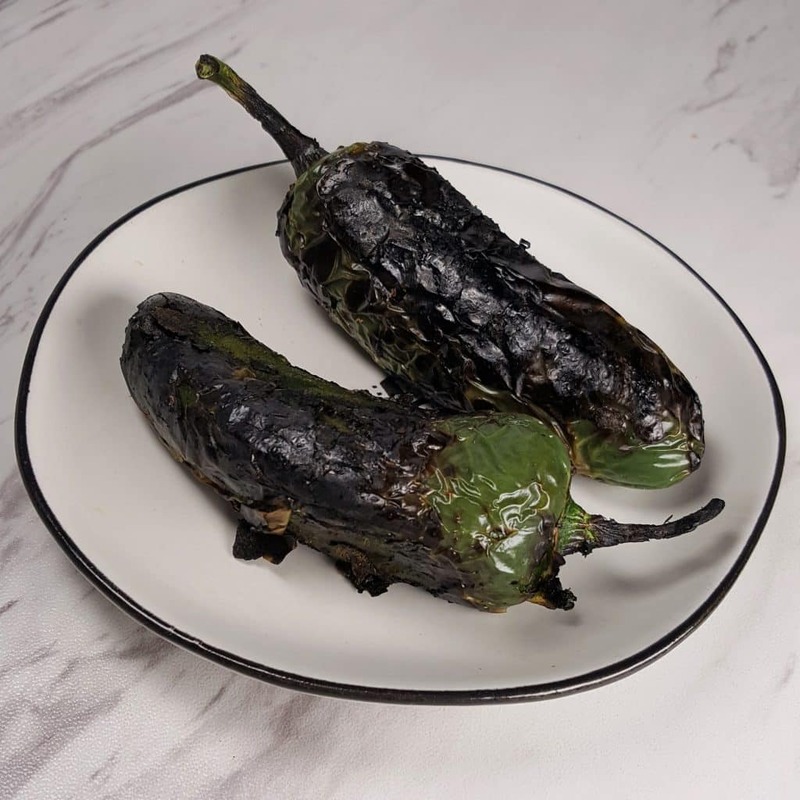 If Pasilla peppers are not readily available, try Poblano or Jalapeńo Peppers. 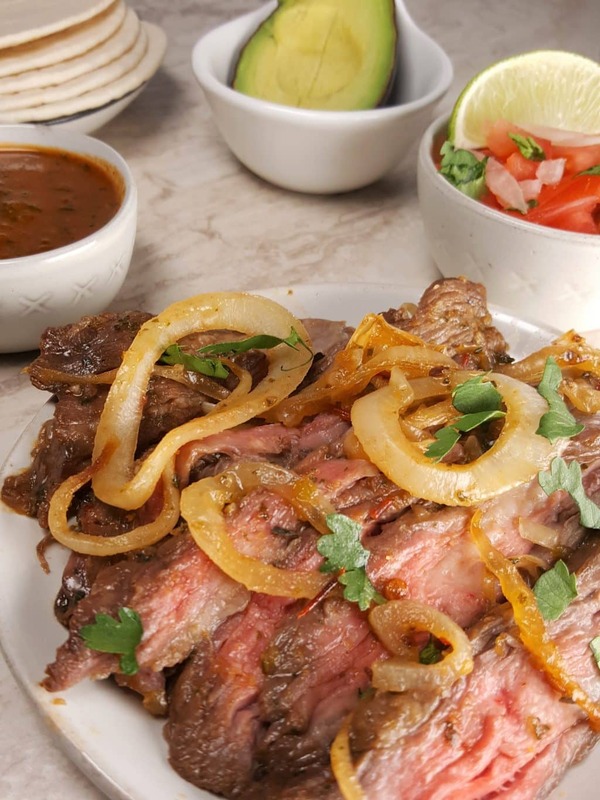 PIN this Air Fryer Carne Asada Recipe! 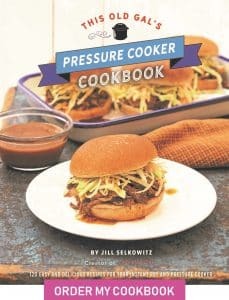 Jill, I have beef that I had butchered and do not have skirt steak. What could I substitute? This sounds really good! I see where you make extras to freeze with your Foodsaver. How do you get that good airtight seal with all that liquid? I Struggle with this! !